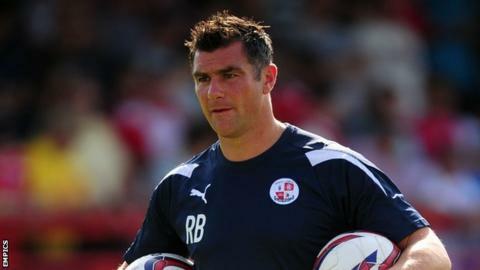 Crawley Town manager Richie Barker says he is ready for the visit of his former club Bury on Saturday. Barker left the Shakers to join Crawley in August after less than 18 months in charge at Gigg Lane. He told BBC Sussex: "I've known [assistant manager] Peter Shirtliff for a long time and some of the players there I gave their debuts to. "I still have an affinity for them. I'll be looking forward to seeing some really good people who I worked with." He added: "From three o'clock onwards, it's about us going and winning the game." Bury handed Barker his first managerial post in June 2011 after a spell as caretaker following Alan Knill's switch to Scunthorpe. "I thought I was ready to give it a go but you always need a little but of luck and I was in the right place at the right time when Alan left," Barker continued. "I did well out of Bury. I joined them as a youth team coach and ended up leaving to become a League One manager elsewhere. "But they did pretty well out of me as well. "When I took over they were a League Two side who were only just in the League Two play-off places. "I left them as a mid-table League One team who were financially secure and with players that were worth money." Crawley lie in the League One play-off places and Bury are bottom of the table but Barker says there is no room for complacency when the two sides meet at the Broadfield Stadium. "I'm not going to say they are struggling, because they are not," he said. "They are better than where they are. "They've got enough players in the team to get something out of the game. "They are in a slightly false position and if we go in into the game thinking it'll be easy we'll end up getting nothing out of it."